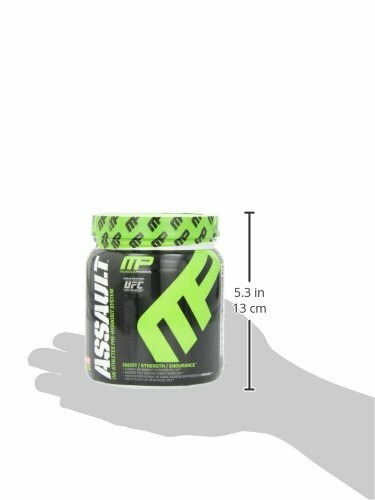 Assault, MusclePharm’s pre-workout drink, promises to be a complete performance mix for athletes to help them achieve energy and focus needed to contend with the competition and get the most from their training sessions. MusclePharm Assault promises five effects essential to progression in athletics: size, energy, focus, strength, and endurance. In every scoop of Assault are the ingredients needed to deliver these effects: two grams of carnosyn beta-alanine, ion-3 nitrate technology nutrients, and the patented purenergy ingredients. This goes beyond traditional supplementation of caffeine, which provides energy and alertness on its own. Assault lasts several times longer, is more effective, and comes without the dreaded crash of other formulas. At just ten calories, Assault undercuts most pre-workout drinks, including most packaged and mixed creatine formulas. Gluten free and free of unnecessary additives, this drink is easy to digest. Enduring energy that lasts beyond the duration of most training sessions. With a hydration system, and a fast-dissolving texture, cotton mouth is never a issue. Low carb count never leaves people feeling feeling bloated after drinking. This pre-workout drink is no stranger to even the most amateur of athletes. And because of that, there are a great deal of of formulas that promise results. But just what does Assault promise to do, and how does it deliver that promise? With its ingredients, the assault formula has been proven to boost performance and endurance of muscles as well as promote the buffer of lactic acid. Beet root and hawthorne berry, also included, increase production of nitric oxide and plasma nitrates. These reactions promise more endurance during workouts thanks primarily to the nitric oxide boost. Added to the formula is creatine, arginine, and the indispensable BCAAs that are well known to pre-workouts. They work in connection with ion-3 which fuels vasodilation, whih are fueled by nitrates, increasing blood flow to deliver nutrients faster and more efficiently to better athletic ability and eventual recovery post-workout. With the ion-s promising so much, just what makes it up? That would be creatine nitrate, arginine nitrate, and BCAA nitrate. These increase ATP levels that rise with the boost in nitric acid. This helps with growth hormones during rest, and transport of nutrients from foods and supplements before, during and after a workout. The extra attention to ATP is essential due to its role in feeding muscle-building nutrients and repair. While repair and growth are essential to the goals of many athletes and athletic people. However, a pre-workout drink is useless if it does not fuel actual workouts. In other words, energy is a key component of Assault and the reason why many would try it. The highlighted energy component is MusclePharm’s purenergy. Purenergy, a patented ingredient, goes beyond the demands of caffeine, which most people rely on to supplement workout. But purenergy does not dismiss the essential benefits of caffeine, instead it combines caffeine and pTeroPure pterostilbene to delivery a steadily increasing energy level without an eventual crash that is common with traditional caffeine. Another issue with supplementing workouts with caffeine as an energy booster is the possibility of dry mouth during the course of a workout. This can be distracting, and potentially dangerous as the body becomes dehydrated during physical exertion. Assault covers that with a Hydration System that combines four components to prevent dehydration: electrolytes, coconut water, glutamine, and taurine. Electrolyte balance, which regulates cell function, means maintaining the levels of potassium, phosphate, magnesium, and sodium in a leveled state. Coconut water, often cited as a “super food” assists in balancing electrolytes by reintroducing these nutrients to the body. Glutamine and taurine work in connection to move electrolytes while also replenishing amino acid and glycogen stores. With the benefits of feeding muscles with hydration and essential nutrients, and assisting in recovery and delivery of nutrients post-workouts, athletes from a variety of backgrounds will find use for MusclePharm’s Assault. MusclePharm’s Assault comes with frustrations found in many pre-workout drinks. Those with allergies will find themselves having to search labels and perform extensive research before taking Assault or suffer the ravages caused by the use of dyes and artificial flavoring. While Assault doesn’t feature many artificial additives to its mix, they are present in noticeable doses. Another issue concerning unique physiology is the effectiveness of this pre-workout drink. Athletes with a cleaner diet and tested physiology may have better results using Assault, as the efficacy of blood flow, ATP functions, and electrolysis is beyond that of the average gym goer. Those starting out in their journey or fitness or do not have long-term strength or endurance goals may want to reduce their servings of Assault until they reach a point where the pre-workout will be most effective. Variant pricing may also confuse those new to supplementation. Depending on which site or store a person visits they may find themselves paying an inflated price for Assault. Those who are new to purchasing such things should price compare before committing to a purchase of Assault. MusclePharm has promised performance and muscle gains that many other companies have in the past. But, fortunately, the ingredients in Assault create a well-researched and effective product. Athletes and fitness enthusiasts who have a dedicated regiment, clean eating plan, and dedication will find a useful tool in Assault. The benefits for muscle growth and recovery are high and can help reach goals that are near impossible without some form of supplementation. The recovery benefits and the assistance to nutrient allocation and utilization make it even more indispensable to an athletes supplement rotation.